Aging-in-place design - talk about bad word choices. This is America. We’re not getting older, we’re getting better. Sixty is the new 40. They’re all clichés but, hey, I believe them. If you or someone you love is the new 40 or older, then you should read this article. That sounds like an ad for an insurance policy, but it’s true and it includes pretty much everyone. Ask anyone who’s retired where they want to be living in a decade, and the overwhelming majority of them will say, “Right here – at home.” Aging-in-place design is a way to make that desire a practical reality. I’m not saying that when you turn the old 6-0, you should remodel your home with old age in mind. I am saying that if you remodel your home and you want to keep living there for years to come, remodel it with the future in mind. You don’t need to install grab bars before you need them. But if you’re remodeling your bathroom, you can add blocks to the framing when you pull the tile on the shower or bath walls. Then if you do need to add a grab bar, you can just drill it in, and you won’t have to tear out that beautiful new tile to install the grab bar. If you never need those bars, so what? It didn’t cost you much at all, and no one will ever know how smart you were. Maybe that’s a bad thing. The shower does have grab bars, but they’re not that old, massive, ugly style. 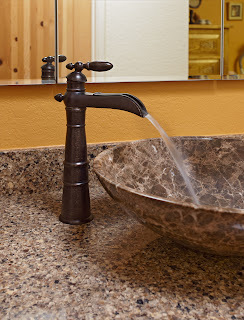 The beautiful faucet has a single-lever handle, which is easy to operate. My client said that she felt like she was washing her face in a fountain when she used it. I’m imagining a fountain in Italy…. 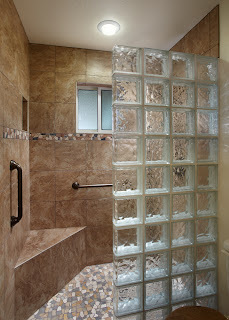 The shower has a seat, textured flooring in the guise of chipped stones and a flush shower entrance. 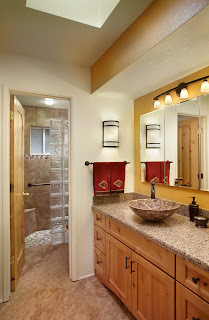 If this were a larger bathroom, the design would include a wider shower entrance and a larger space in front of the vanity. The bathroom design also includes a number of green features designed to save energy, conserve water and improve indoor air quality. LED and CFL lighting fixtures promote energy efficiency while a Water-Sense certified faucet and toilet reduce water consumption. 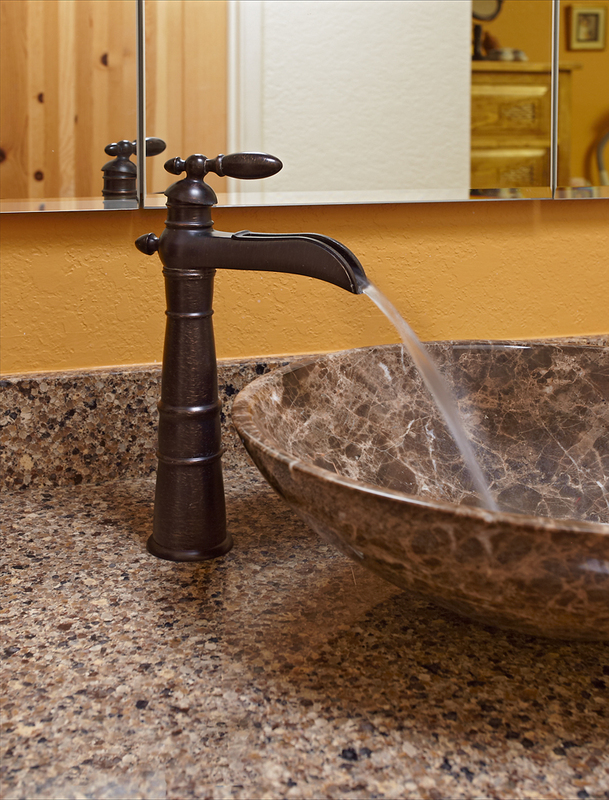 The Greenguard-certified quartz countertop and no-VOC paint reduce toxic emissions. A last word: No matter what age you are, if you (or someone you love) have mobility issues and are in danger of falling – rehab your home now. Don’t wait for the fall and broken bones that can change someone’s life forever and not in a good way. Falling isn’t the only issue that aging-in-place design addresses, but it is one of the important ones.